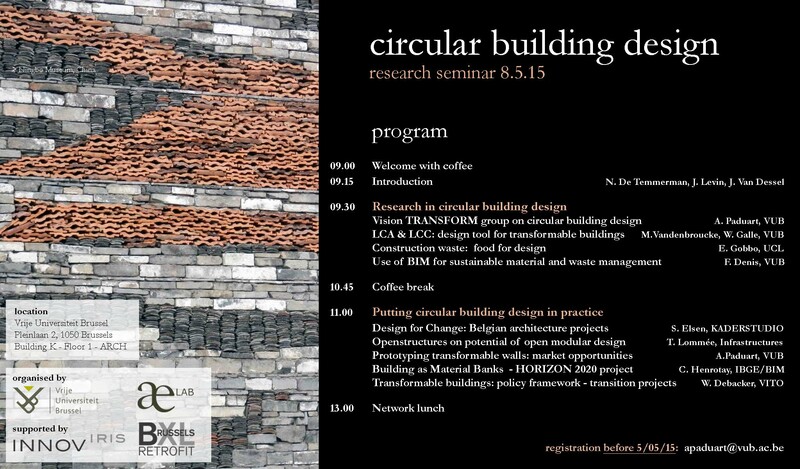 In the context of the DynStra-project, the research group TRANSFORM organized a seminar on ‘circular building design’. The seminar took place on Friday 8 May 2015 at the Vrije Universiteit Brussel. Ten different speakers presented work concerning the use of building materials during and after the demolition of buildings and how to prevent material disposal in the future by focusing on the design of “transformable structures”. The Dynamic Wall System being developed in the DynStra project was presented by Anne Paduart (more information in the next post). An overview of the presentations is available in the program below.